I was sent two different products to try out, Soy & Flaxseed Schnitzels and Rice Protein & Chia Stir Fry Strips. Both of these products come under Fry's newest 'Natures Plant Proteins' selection and are geared towards providing healthy, vegan friendly and protein packed nutritious food. When the boxes arrived I was pleasantly surprised by the new look packaging of Fry's products. I've always been used to their bright green boxes in the past so this new cleaner and more contemporary packaging really appeals to me. First of all I decided to try the stir fry strips within one of my usual dinners. I do love to cook up a stir fry and I find that it's one of the quickest and easiest vegan meals to make. I never usually include any form of meat replacement in my stir fry's as I usually find that loading them with lots of veggies is enough for me. I've also been weary of fake meat style products in the past as I naturally went off the taste and texture of meat when I first made the decision to give it up. That being said, I am always open to trying new things particularly when it comes to vegan products. The stir fry I made was very simple and included rice noodles, bean shoots, broccoli and a chilli & garlic sauce. 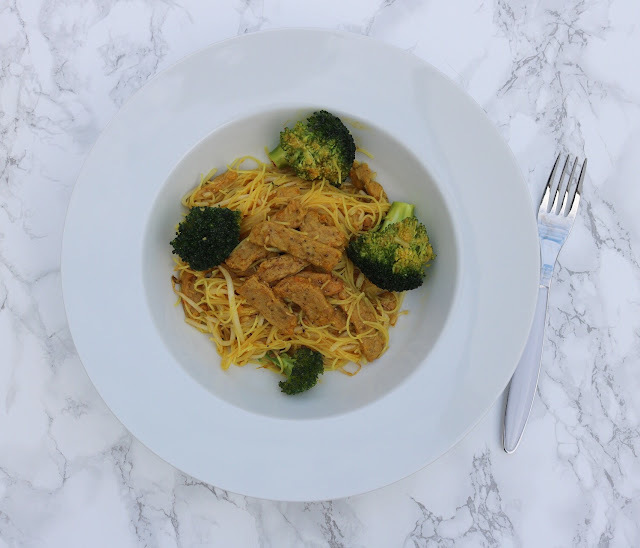 I found that the stir fry strips were really easy to include with the rest of my ingredients and in terms of ease and quickness they made no real difference to my usual routine taking only a few minutes to cook. I really wasn't sure how I was going to take to these strips as the thought of meat or chicken really turns my stomach these days. However, I really was pleasantly surprised! I thought that they worked really well within my stir fry and reminded me a lot of tofu. They're very light and soft in texture but also surprisingly filling. The fact that these stir fry strips are high in protein, iron and fibre is a real draw for me. I often worry that perhaps I am not getting enough of these nutrients in my diet and I try to counteract this by taking daily vegan multivitamins. I do think though that I could get used to incorporating these into my meals as an extra source. These strips area also pretty versatile with no overbearing flavour so they could also be used in wraps, pastas or curries. I know so many vegans and vegetarians who really miss the taste and presence of meat on their plates and I am sure this product would make an ideal replacement for them. Personally I don't feel that there is a huge noticeable difference between the two other than that an animal thankfully hasn't lost its life! But then again that's coming from someone who hasn't eaten meat for two years so maybe a carnivore would completely disagree with me. In any case I think from an ethical, health and environmental standpoint, the fake meat will always win! Next up to try were the Schnitzels. I honestly can't say if i've ever tried a real meat Schnitzel in my life before going vegan. I have a vague memory of being in Vienna many years ago and being served up something which looked very similar to this but I decided against trying it. When I opened up the box they looked like and reminded me of chicken escalopes which, back in the day, I used to eat a lot of. My husband and I often reminisce about one of our old favourite dinners which consisted of chicken escalopes with chips, beans, coleslaw & BBQ sauce. And to this day we haven't quite found the perfect vegan equivalent aside from using veggie burgers. The Schnitzels were again really easy to cook taking approx 15 minutes in the oven. Even though i'm fully aware they are not meat based my old meat cooking ways still came into play and I left them in the oven for a further 3 minutes to avoid any resemblance to what it was I was eating. There really was no need in this case as these Schnitzels are made purely from soy and what protein with flaxseeds, so there was definitely no risk of any blood or animal fat freaking me out! Again, I really wasn't sure what I was going to make of these Schnitzels but I found them to be delicious. I loved their crispy, crunchy coating and the texture of the soy didn't remind me too much of meat at all. My husband and I both agreed that we enjoyed the taste of the Schnitzels and they really are unlike anything we have tried before. They would also make the perfect replacement for our old favourite dinner so next time i'm looking forward to enjoying them with some chips and beans. Just like the stir fry strips, these Schnitzels are high in protein, iron and fibre but they also come with the added benefit of being rich in omega-3 fatty acids and vitamin B12. They're also only 191 calories per serving which makes them a pretty good option for those of us who are on low calorie diets. I'm really glad that, despite my initial reservations, I gave both of these products a go. They wouldn't be products that I would usually choose to buy but by trying them I now know that I would definitely pick these up again in future. They both sound interesting! I've just tried their nuggets for the first time and really enjoyed them, so definitely looking to try more from Frys now!